James Hoare was born in the first quarter of 1887 in the civil parish of Monks Coppenhall, Crewe, Cheshire (Registration district Nantwich). The 1891 census RG12/2851 page 25 records his father as George age 36, a Coach Man Domestic, born in Newport Pagnall, Bucks and his mother as Caroline age 42 from Wharton, Cheshire. His uncle Joseph Hoare age 24, a Crane Driver, was living with them. He had siblings Bertha age 11, Alfred age 9 and Louisa age 7. He may also have had another brother Walter born 1885 who died age 3 in 1889. At the 1901 census RG13/3358 page 37 he is 14 and still living in Monks Coppenhall. His father had become a Barman. By 1911 he had moved to Rugby and was boarding in the home of John and Alice Law at 10, Grosvenor Road. He was age 24 and employed as a Shop Assistant with the Co-operative Society. He initially appears to have enlisted in Coventry with R. Warwicks Regt with number 4478 but is later listed as Private James Hoare with the 271st infantry battalion of the Machine Gun Corps with number 43375. He drowned at sea on Monday 27th May 1918 when the troop ship H.T. “Leasowe Castle” was torpedoed on the starboard side by German submarine UB51 with the loss of 83 or 93 lives. Some 2800 men survived the sinking by taking to the liferafts/boats. The ship was hit at 0130 when she was travelling in a convoy 104 miles north-west of Alexandria and sank suddenly within 90 minutes when a bulkhead collapsed in the aft part of the ship gave way. Most of the men still on board were carried down with ship and not a single body was picked up. 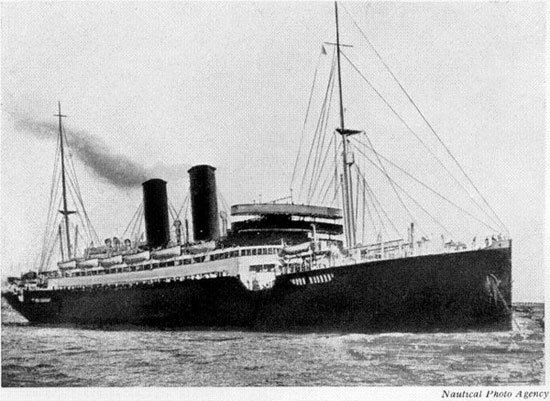 The dead included the ship’s captain and the officers organising the evacuation. This entry was posted in Biography and tagged 1918, Hoare, Leasowe Castle, Machine Gun Corps, Monks Coppenhall by Christine. Bookmark the permalink.